Complimentary Parking now available. We validate! Bulla (boo-ya), which is slang for chatter and what people are talking about, is devoted to delight you by serving your favorite Spanish dishes such as “Patatas Bravas," "Huevos Bulla," "Buñuelos de Bacalao," and other tapas, as well as tantalizing daily specials from our kitchen to bed shared amongst friends. We select only the finest and freshest ingredients, accented in our authentic, savory cuisine. Our ambiance is created to stir the senses and stimulate your appetite. We invite you to join us to indulge in a celebration of good taste! Bollinger, Special Cuvee, Brut, ÉPernay, N.V.
Join us at Bulla for your Mother's Day celebration, opening at 10:00 am for brunch! Or indulge in our special paella’s menu for Mother's Day dinner. All moms will receive a $20 gift card during dinner to celebrate her day! Great food and service! Definitely coming back! Highly recommended!! Very good food!! I love the ambience and you can stay there forever oh my god , i dont want to go. Super fun atmosphere and amazing food. Service was on point. I highly recommend DeAndre. The bulls eggs and tuna tartare was delicious. Can't forget the churros. Manager is awesome and come and greets you to make sure that you have what you need. Very nice global-neighborhood feel. The food was average, nothing spectacular. So good! Creative dishes, great wine, fun vibe. This restaurant is awesome. The service, food and drinks are great... always very consistent. Fun but loud in main dining room. Prompt and cheerful service. Ordered 4 tapas dishes for 2 people, which was plenty. 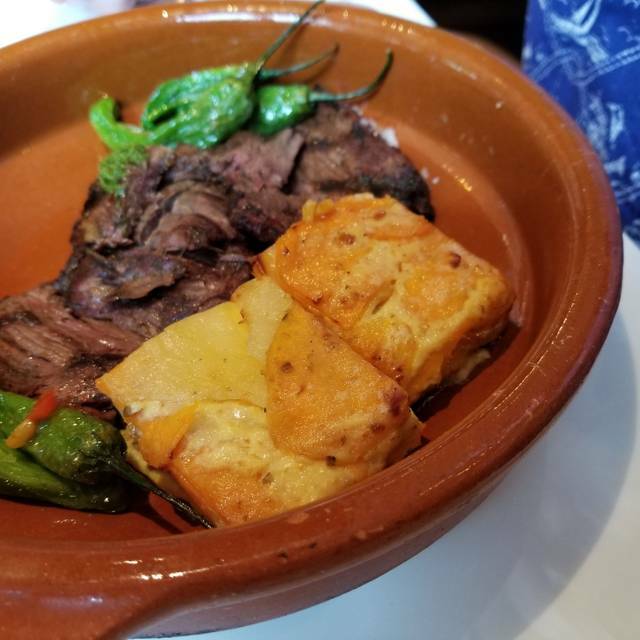 Stuffed shishito peppers and patatas bravas (spicy!) were excellent, ceviche was good, calamari nothing special. Wanted to try the paella, but it takes 45 minutes. Next time. 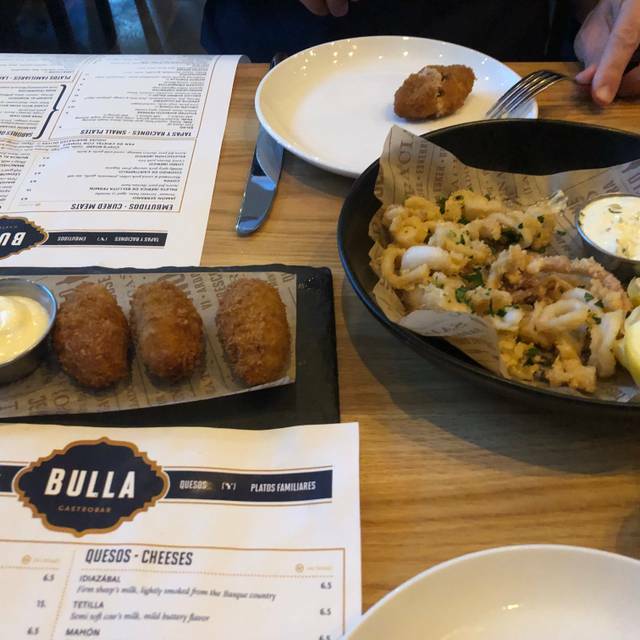 Food at Bulla is very good. However, the service is very spotty. (Forgetting to input some of our tapas order/having dessert come out before one of the entree items/forgetting some dish modifications requested). Also, prices are high and we left not feeling full - but that's the risk you take with tapas. Service was great. Tapas were quite good. They validate parking in the garage shared with the building that houses the restaurant. Food was awesome, and service by Gabi was great to. Will definitely come back. Awesome food and ambiance! Tapas were excellent and good mix of options. My only complaint is that we got almost our entire meal and still hasn't gotten our drinks, which was just disappointing. The bar didn't look super busy, but obviously it was understaffed. The food was great, I would definitely go again. This place was delicious! I lived in Spain and this place was as close to being back I've ever gotten. What a great Birthday surprise , Excellent service, fantastic authentic SPANISH cuisine. More than ample potions on the small plates so go easy until you see what you get. Food is cooked to order so go with the flow and enjoy this great spot. Vegetarians accommodated with ease The 5 star service is almost as good as the food. 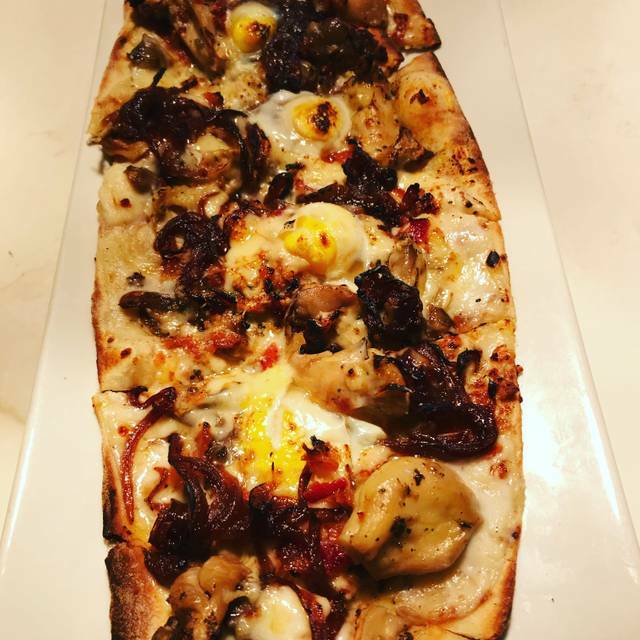 Enjoy this awesome addition to Midtown Dining scene! I’ve been here before and I loved it. The night i actually made a reservation was the total opposite. After being seated, we waited 15 minutes and no one came to greet us. Tables around us were being taken care of but no one even asked if we had been helped. I brought a friend with me & it was their first time there and i was so disappointed that their first impression of this restaurant was that no one cares. We left after waiting 20 minutes. The time before was awful too but swept it under the rug & told myself the bar probably isnt a good area to sit bc theyre so busy. Food choices were interesting, filling and most of all flavorful. Our server was outstanding because she was attentive and knowledgeable about every item on the menu. The shrimp and fish ceviche was amazing as was the cheese and chorizo platter and sizzling shrimp. I particularly loved how adept our server was at suggesting certain pairings of tapas plates. My date and I sat outside near a heat lamp. It was cozy but the bench was not comfortable - the padding was thin and the bench wasn’t level. Beyond the seating, I give Bulla Gastrobar two thumbs up 👍🏽👍🏽and a high five🙌🏽! Great place for a nice dinner. Pricing was reasonable, dishes were both delicious and perfectly portioned for 2. 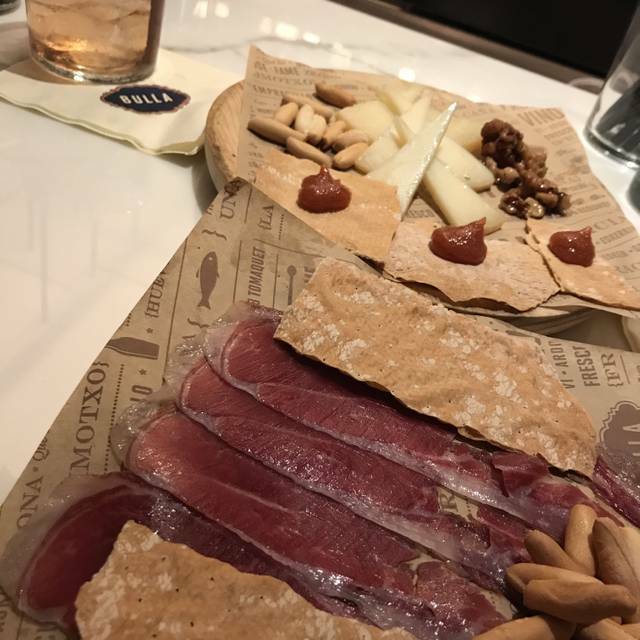 Very good cocktails and tapas! Very filling meal and great atmosphere! The food was delicious and our server was knowledgeable, funny and totally on the ball. Great cocktails too. Really enjoyed the variety. The salad was so cold that it felt frozen, borderline hurt to eat. Love the place, great Spanish food. 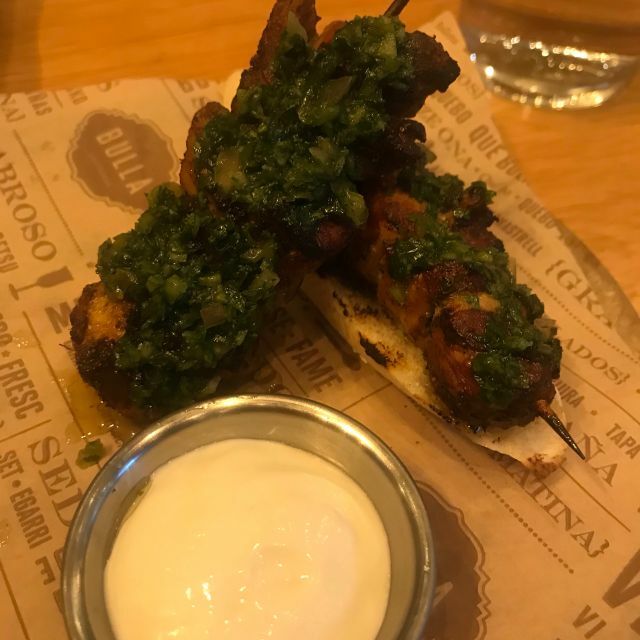 Luima, Thank you for your visit and for taking the time to write about your experience at Bulla. We will be looking forward to your next time with us. Beautiful place! Our sevice from Lucy was excellent. Her ability to recommend was spot on. I will return my next time in a Atlanta and looking forward to trying a couple of their other locations too. 5 star all the way. Food was good but service was below par. Not all food came out at the same time and our waitress did not check on us. By the time we got there they had run out of a lot food items that we wanted to eat which was disappointing. Worst of all though was the service. It was extremely slow. We didn’t even get water until after we got our drinks. At one point one of the menu items was taking a long time to come out so we just cancelled it because we were getting ready to go, 5 mins later it still comes out and we are still charged for it. I’ve been here before and had a much better experience but this time service fell really flat. There were 5 of us and we got seated right on time on a Friday night. We had the chef's board - all good. 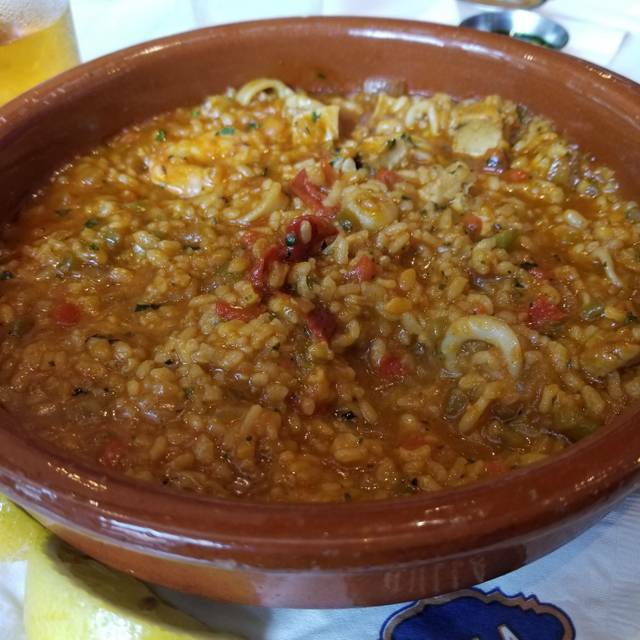 We shared the chicken paella (1 guy was allergic to shrimp) and it was very good. I especially liked the jalapeno ceviche. I'm not a big fan of calamari, but it was good - others thought great. Our waiter was attentive and she wrote down the ingredients of the stuffed dates, which were a perfect sweet & savory balance with chorizo and cheese. Katherine was our server and was one of the best servers I’ve ever had at a dining experience. Paella was not made well; not crispy. 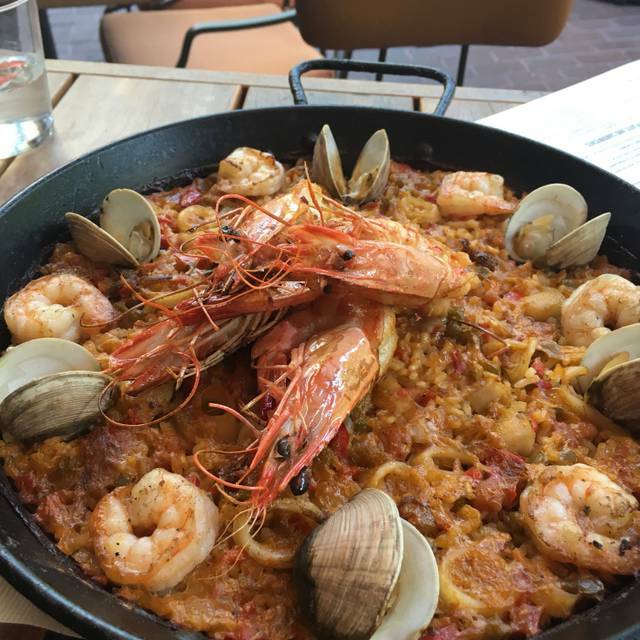 A fun place with interesting food options, tapas and regular meals and specials, good beer and drinks, can get a bit noisy inside, outside dining is very nice weather permitting. Service is always very good. The food was okay but service was really disappointing. I think our server was Grace and she seemed to be unhappy to be there, never smiled and provided very slow service. I won't be back after this experience. Food is hit or miss. 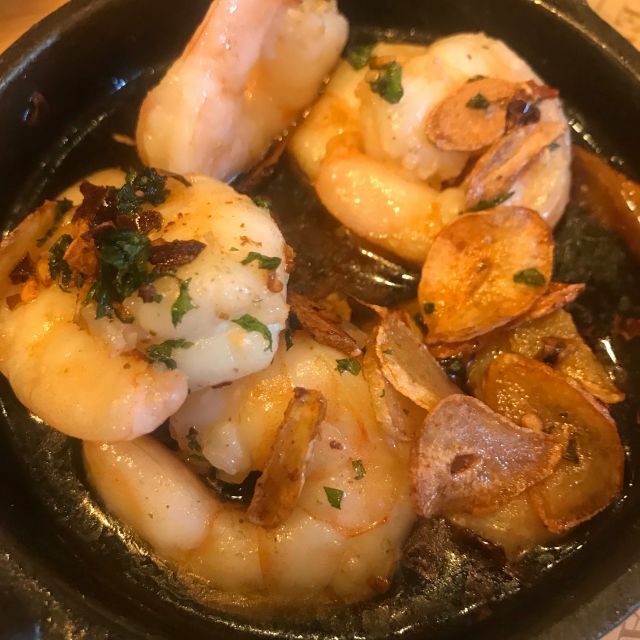 Shrimp we got was great. Octopus burned. Drink order turnaround time from the bar is slow. Overall fine but I’d be inclined to spend this amount of money elsewhere. The service was good, the food was great, and we enjoyed our evening. I would return here if I lived in Atlanta. Never been here but was curious about the paella. Started off with some tapas and the best was the potatoes. Highly recommend them but spicy. 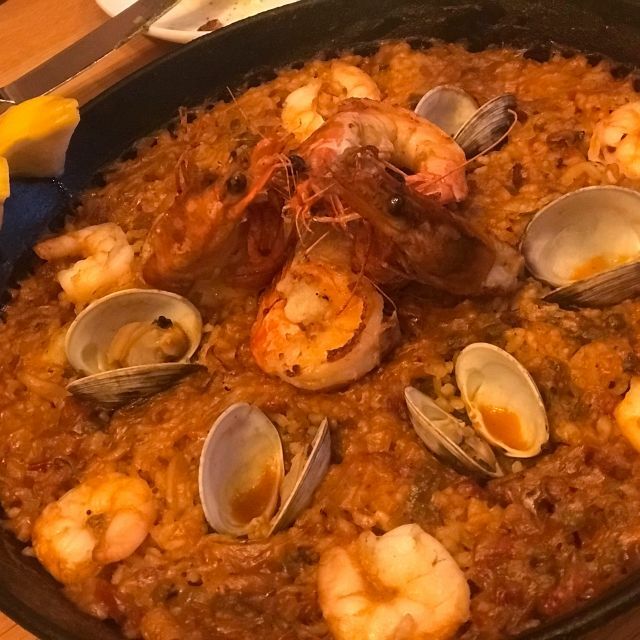 The paella was Awesome. Will be back. Bulla continues to be a consistent winner! Great food quality, excellent cocktails and attentive service. Tuna tartar and corn puree are always excellent, and just the right size to enjoy alone or with friends. It's a definite neighborhood gem for Midtown!